For talks in ECCR 257 (“Newton Lab”), talks are displayed on a 1920 x 1080 wide-screen TV with VGA and HDMI connections. Keep in mind laser pointers do not work well. Visitor parking is in lot 440. Here is lot 440 on google maps. You need to pay at a pay station, then walk in to the engineering center. 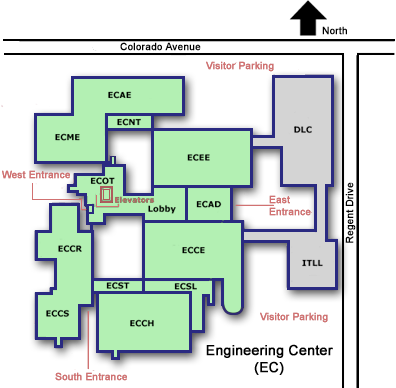 The engineering center is large and can be tricky to navigate so we have maps below. 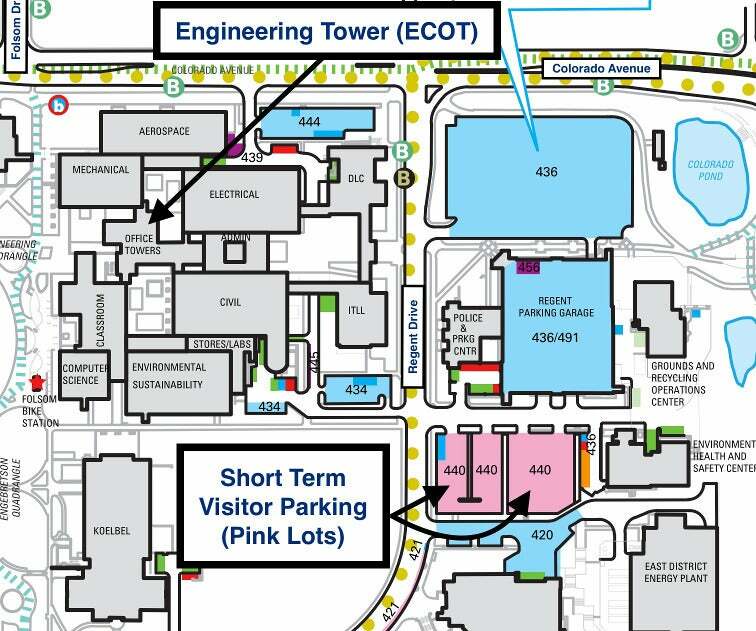 If you enter the engineering center from the West, near the math building, then there is a clear main entrance ("West Entrance") that puts you in the lobby (near the North cafe and the elevators, and underneat the engineering tower ECOT), from which it is easy to get around. Entering directly from the East is a bit more confusing because you are one floor lower, and need to find the right stairs to go up. If you find the East Entrance, this takes you into the main lobby area. As a reminder, the Math department and Applied Math department are in different buildings.